Welcome to our blog hop! We have some new DT members and we're excited to welcome them to the team. I'm also a little sad to see a few talented ladies leaving us and I wish them all the best! 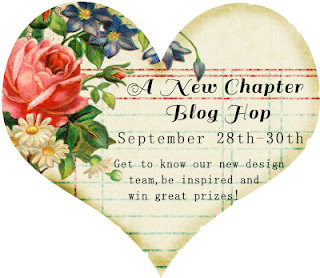 This blog hop is all about a new chapter, a new beginning. I created a layout about a new beginning we recently celebrated: my son's Bar Mitzvah. This marks a new stage in his life, turning from a boy to a man. We celebrated this special day in a big party with all our family and friends. In honor of this special occasion I created a special album with photos of my son in different ages. Each page also had space for someone to write a blessing or some words of wisdom. This is the cover of the album: 13 YEARS OF MAGIC. You are invited to create a layout or mixed media project that represents a new chapter in your life. Whether you have already begun this journey or you are thinking about it, we want to know about it. So go ahead and create this special project and don't forget to link it up to SEM before October 5th, 11:59 PDT! For your chance to win the grand prize, please become a follower of SEM blog and comment on all the blogs. When you are done, you must go to SEM blog and tell us that you have commented on all the blogs! Linking up your project will give you an extra entry to win! *Twist: Use book pages or book text on your project...be creative! Have fun creating and hopping! I'm not sure what it says but the antique look of the photo and the way you cut it out is darling. I love the book pages in it too - it all meshes really well. Thanks for the inspiration and for sharing! What a beautiful layout! Love the cutting on the photo and stitching. Just beautiful! Great layout, love the cut-out of your son! wonderful work! an awesome work of heart! the cut out is cool! Fun layout! Mazal Tov ad 120!! wishing him all the best!! mine is having his in a year an a half. Its getting very close for us too!! Congratulations to your son firstly on his Bar Mitzvah! Such a big step in his life! Great new chapter to scrap about for this theme! And I would have loved to see pics of the album you mentioned! That sounds like a great idea too.. Wonderful present that he can have to look back on..
Congrats to your handsome young son! Love how you literally made a book! I love the cover of your book. What a perfect project for this prompt! I like your great idea of having your son sitting on the text. It is very creative! Such a creative page, you did a very nice job! and wish every blessing on your son ! Gorgeous layout! Excellent use of "white space"! Thanks for the chance to win and the inspiration!